Oklahoma quarterback Kyler Murray thrilled the nation this year, as he dominated defenses with his incredible running and passing ability. 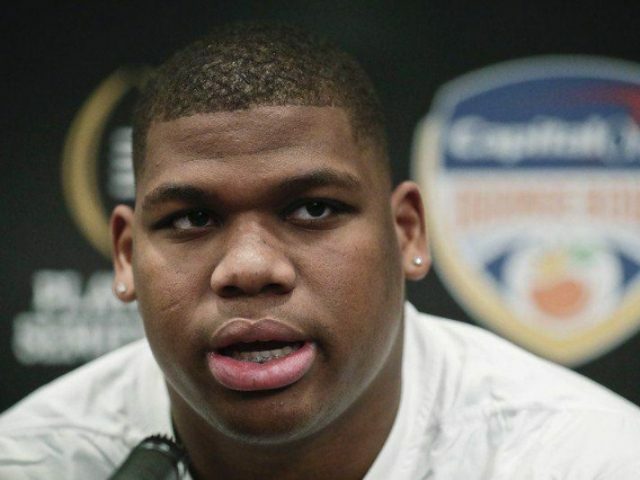 However, one person who seems decidedly unimpressed by Murray’s athletic prowess is Alabama defensive tackle Quinnen Williams. The Bama defender and future 1st round NFL draft was answering questions from reporters on Thursday, in advance of his team’s College Football Playoff Semifinal game against Oklahoma on Saturday. During those interviews, Williams was asked if he’s ever faced a dynamic quarterback like Murray before. Williams’ head coach Nick Saban is notorious for both talking-up opponents before a game and, not giving them any motivational material. Which is likely what caused Williams to immediately apply the brakes to his trashing of Murray. No matter though, Williams and Murray will have their chance to prove who’s overrated when they face each other on Saturday night.